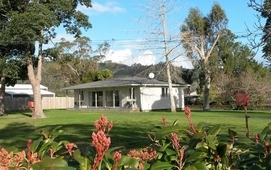 We are directly opposite the harbour on the main street in Whitianga. The little sandy beach across from the camp is a good place to launch a kayak or take the children to explore the estuary at low tide. With the town centre just 450 metres along the road, you can leave your car at the campground and stroll to the cafes and shops. Our small holiday park is ideal for families. We provide a safe, relaxing, family-friendly environment in which to enjoy yourself and our lovely little town. Our budget accommodation ranges from well-maintained standard cabins to our refurbished self-contained studio flats and two-bedroomed tourist flats. 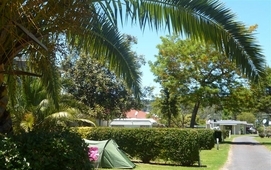 We have large, level, sheltered powered and non-powered sites for camping. Shade is provided by beautiful mature specimen trees. The outdoor swimming pool is popular in summer. The large covered dining area, with two push-button BBQs and plenty of tables, allows you to prepare and enjoy your meals outdoors. We also have a communal kitchen, laundry, clean toilets, and new tiled showers, a communal indoor dining area and small lounge , TV room, boat wash, fish cleaning area, and small adventure playground. For your convenience we have a camp shop. You can purchase barista made espresso coffee, ice-blocks, snacks, ice and basic toiletries. Wireless internet is provided by IKS, with plans from $5.00 for 10GB. Complimentary 100MB WiFi is given with each booking for you to check your emails. 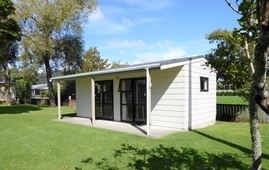 Make Harbourside Holiday Park your base from which to explore the Coromandel Peninsula. Hot Water Beach and Cathedral Cove are only a 35 minute drive away. The historic town of Coromandel can be reached via the beaches or through the 309 Road (with its kauris) in less than an hour. Sorry, no pets are allowed in the park.